Last week, when I entered the room, I noticed not only that it was so dark (even during the day) but that there were no lamps to be seen. Are they just moving into this home or are they getting ready to move out of the house? Where were the lamps? Were they on order, stolen from the house, in a repair shop? No, the homeowner never thought that they were needed since there were numerous recessed lights in the ceiling. Hmmm ... I thought. But what about task lighting when you're reading? What about creating mood from the glow of a lampshade. Or, adding a neat little accent light on the mantel? As Clodagh says "In a bedroom, you need what I call a 'love light' - a lamp you can dim..." Or perhaps you might agree with James Huniford and I - "A room should have multiple kinds of light to balance it and give it interest." 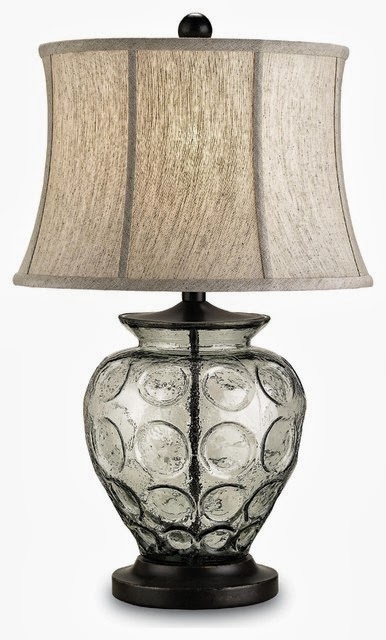 Every evening after a full day of work, I love to turn on the 'black frog' lamps on our sideboard and light the alabaster lamp on our foyer cabinet. Truly, the chandelier in the Foyer's ceiling does not warm up the space quite like that alabaster lamp. If you want to make your home dazzle, sparkle or just look great, make sure you include lamps, chandeliers, candles or floor lamps to your design repertoire. Go BIG in size with at least one lamp on a table - go ahead, make a statement!